On the 3rd of August 1914 Germany declared war on France and invaded Belgium. On the 4th August 1914 Britain declared War on Germany. Germany began the war with the implementation of the Schlieffen Plan but after their defeat at the Battle of Marne in September 1914 and their subsequent withdrawal they started to dig in to secure the gains they had already made. Trench Warfare as we have come to know it really started from about November 1914 onwards when the two opposing forces became bogged down, neither being able to overcome the other. This stalemate continued throughout 1915 with the lines of trenches eventually extending some 475 miles from the North Sea, through Belgium and Northern France and onto the Swiss Border. Allied strategy for the coming year of the war was set at the Chantilly conference held in Paris, on 6th December 1915 which called for large scale offensives to be carried out on every front in order to break the deadlock. On the 19th December 1915 Sir Douglas Haig took over as Commander in Chief of the British Expeditionary Force. Haig favoured an attack in the Ypres salient of Belgium but General Joseph Joffre the French Commander in Chief and Haig’s senior in the partnership insisted that an attack should be mounted in the Picardy area to the South. Haig really had little say in the matter and so a joint French and British attack was planned for early to mid-summer 1916. The area around the Somme had already seen fighting in August 1914 and again during the German withdrawal in September of that year. In August 1915 the British took over a 14 mile sector of the formed line of trenches previously occupied by troops from Britanny. It’s hard to think of the Somme offensive without taking into consideration the events at Verdun. The Germans naturally had their own plans and their offensive on Verdun began on 21st February 1916, so part of the additional need for the Somme offensive also became the need to relieve the pressure on the French as the fighting at Verdun was still in full swing. The Battle of the Somme started on the 1st July 1916 and ended on 18th November 1916. Some 55,000 plus casualties were estimated to have been suffered by the British Forces on the first day, 19.240 British and Dominion Soldiers killed and 35,493 wounded, not counting French Casualties and it is with that mind-set that the battle is often thought of:- A failure. A generation of lost youth. In fact the French had total success on both banks of the Somme. British XIII Corps took Montauban and reached all their objectives. XV Corps captured Mametz and isolated Fricourt. X Corps in the North attacked and captured the Leipzig Redoubt, but got stopped at Thiepval. On the left they overran the German front line and both the Schwaben and Stuff redoubts were captured. The III Corps attack either side of the Albert–Bapaume road was a disaster, and they made only a short advance south of La Boisselle. German counter-attacks recaptured most of the lost ground north of the Albert–Bapaume road and they succeeded in defeating fresh attacks against Thiepval. The Germans were forced to send men and equipment from the Verdun area which helped relieve the pressure on the French and the effectiveness of the attack placed on the Germans on the South Bank of the Somme cause a substantial withdrawal from that area. The Battle of the Somme can be looked at in 3 phases: Phase 1 from 1st to 17th July 1916, Phase 2 from July to September 1916 and Phase 3 from September to November 1916. Each of these phases contained a series of individual battles in their own right. As no breakthrough had been achieved then a war of attrition set in to grind down the German forces. The Somme also saw the introduction of Tank warfare in September 1916. Overall the battle caused 415,000 British casualties, 200,000 French casualties and upwards of 600,000 German casualties. These numbers are unimaginable in this day and age and it was with these facts in mind that this diorama came into being. I have not tried to portray a specific unit, place in the line or time but a reflection of life for the British Tommy in the trenches just prior to the start of the battle during the summer of 1916. In human terms, the Battle of the Somme was probably the most costly battle ever fought in world history. Its success or failure I leave to others to decide. It did however start to change the outdated tactics and training that were still being employed at that point in the conflict and it started to change the social structure of an entire nation. The Imperial War Museum photographic archive provided not just reference material but inspiration for a number of the settings and figures within the diorama. Hey Alan, Congrates on becoming a feature, this one deserves it. Beautiful job. 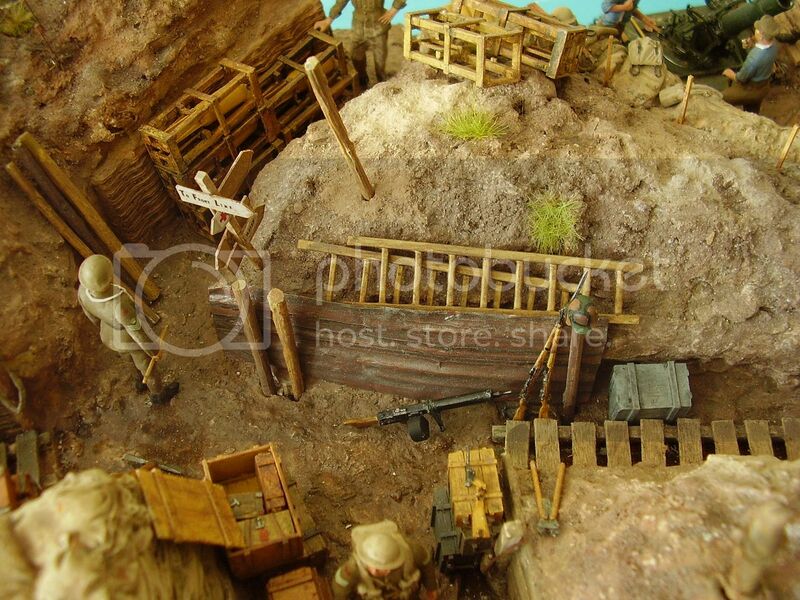 All the little stories blend together and give a very realistic view of life in the trenches. I very much enjoyed the build from beginning to the end. Kind of sad that it ended, but it ended well. Now I see you are off and running on the next. I think this one will turn out just as well from what I see. bob d.
While this diorama is about the Somme, your words reference Verdun, perhaps the other single most invoked name symbolizing futility in war. I spent a day at Verdun with my son last May on our "Band of Brothers" tour of Europe's battlefields. It was perhaps one of the most-depressing days of my life: the ossuary at Fort Douamont with upwards of 100,000+ unidentified skeletal remains, the acres & acres of graves (two/space in the town of Verdun proper and more up across from the Ossuary). The Fort is little more than a shell, and touring it made me wonder how men endured years of this kind of warfare. This is great modeling from a master modeler, I just can't get very excited when thinking about the horrendous waste of life it represents. We need to tell this story. Every village in France we went through had its obelisk with the words "Pour Nos Enfants Morts" (for our dead children) or some variation, with the names of the villagers killed in the Great War. Al, I hope you did not take anything I said as criticism of your fine diorama. While you and I have not always agreed on modeling matters in the past, I have nothing but the utmost respect for your skills and vision. And you are certainly correct that the sacrifices these men (and many women, too) made for their countries must be commemorated. With the centenary of the Great War upon us this August, it's good that we remember how quickly, cavalierly and, yes, cheerfully Europe dragged the rest of the world into the abyss. Satellite photos show Russian forces massing along the border with Ukraine today; it's sad how quickly we forget the lessons of the past.